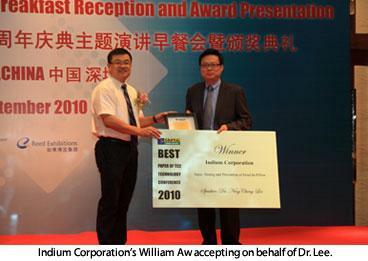 Indium Corporation's Vice President of Technology, Dr. Ning-Cheng Lee, was recognized with Surface Mount Technology Association (SMTA) China South's Best Paper of TC2 Technical Conference at NEPCON Shenzhen, 2010. Dr. Lee's paper, Testing and Prevention of Head-in-Pillow, includes information on test and development of solder paste materials with excessive resistance against head-in-pillow, as well as approaches for the prevention of this defect. Dr. Lee is a world-renown soldering expert and an SMTA Member of Distinction. He has extensive experience in the development of high-temperature polymers, encapsulants for microelectronics, underfills, and adhesives. His current research interests cover advanced materials for interconnects and packaging for electronics and optoelectronics applications, with emphasis on both high performance and low cost of ownership. Dr. Lee resides in Clinton, NY. The SMTA membership is an international network of professionals who build skills, share practical experience, and develop solutions in electronic assembly technologies, including microsystems, emerging technologies, and related business operations. For more information, visit www.smta.org.